Top quality white or transparent LD PE degradable bags. Easy tear-off bags supplied in packs of 100 with the appropriate hole for hanging on the stand. Cases contain 1,000 units. Complete bag: 800 mm x 125 mm. Torn-off bag approx. 750 mm x 125 mm. Printable area: approx. 680 mm x 120 mm. Flexographic printing on one side, up to 4 colours. They hold 400 bags. The plexiglas can be customised with screen printing of various dimensions. In all places open to the public, where special care is afforded to image, premises and customers. For entrences that have less space, the wall dispenser is a perfect choice! 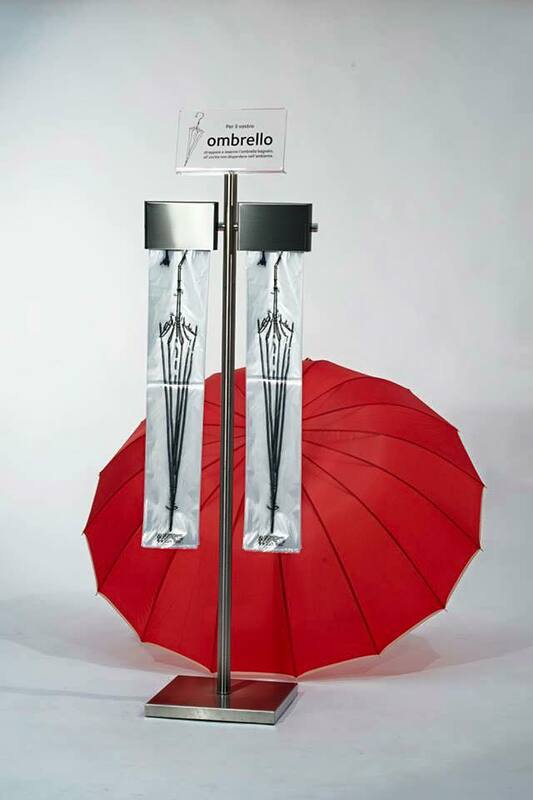 It can be ordered as a kit containing 500 non-customized umbrellabags. There is also possible to order an adhesive patch with text.